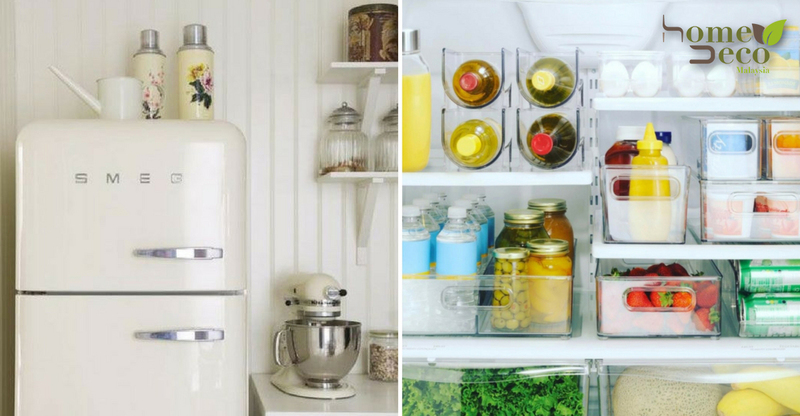 To organize your fridge like how the pros do it, organize the food based on the temperature they need to be cooked at. There’s no need to whip out the thermometers yet! Food that doesn’t need to be cooked to be safe to eat such as prepared foods or leftovers should be placed at the top. The rest of the food is organized downwards based on the temperature it should be cooked at. To illustrate, food that needs to be cooked to the highest temperature such as chicken meat will be placed at the bottom. This is important because it prevents cross-contamination in the fridge. Food safety first, people! Leftovers, drinks and ready-to-eat meals such as cheese, yogurt and deli meats. Raw ingredients used for cooking dishes. Since temperatures fluctuate in this part of the fridge, store only food with long shelf life such as condiments or drinks there. Eggs and milk are not recommended to be placed in the door, as they should be stored in the colder part of the fridge (refer to pic above). Most, if not all of us, put our fruits and vegetables in the drawers below. However, there is a risk of contamination if we store raw meat above the fresh fruits and vegetables. If there are two drawers, make one just for veggies and the other just for storing raw meat. If the drawers are on top of one another, use the lowest drawer for meat. If the drawers are side-by-side, any of those drawers will be fine. If both drawers are needed for the fruits and vegetables, fashion your own meat container or drawer with a plastic bin to catch accidental drips. No matter which drawer arrangement you prefer, it’s still important to clean the drawer that stores raw meat often. Granted, not all fridges are built the same so the important takeaway is to keep raw meat separate from the other food.